SUMMARY: Although radiography of the spine began shortly after Roentgen's discovery in 1895, there was little written in the medical literature about spine imaging until nearly 25 years later with the development of myelography, first by using air and then a variety of positive contrast agents. The history of spine imaging before CT and MR imaging is, in large part, a history of the development of contrast agents for intrathecal use. The advent of CT and, more important, MR imaging revolutionized spine imaging. The spinal cord and its surrounding structures could now be noninvasively visualized in great detail. In situations in which myelography is still necessary, advances in contrast agents have made the procedure less painful with fewer side effects. In this historical review, we will trace the evolution of spine imaging that has led to less invasive techniques for the evaluation of the spine and its contents and has resulted in more rapid, more specific diagnosis, therapy, and improved outcomes. There was very little in the medical literature about spine imaging until nearly 25 years after Roentgen's discovery of the x-ray in 1895. The development of contrast studies of the spine in the 1920s, first by using air and later various radiopaque contrast agents, was the first major development. During the next 50 years, a variety of contrast agents was introduced with the goal of improving diagnostic specificity with less toxicity. The advent of CT and MR imaging dramatically changed the way the spine was imaged. These discoveries have advanced the field of neuroradiology and improved the lives of patients via easier, safer, more rapid diagnosis and treatment. Unlike imaging of the skull and brain, about which textbooks were published as early as 1912, there is very little in the medical literature on spine imaging until the 1920s.1 Historic reviews indicate spine x-rays came into use shortly after Roentgen's discovery in 1895.2 The main use was to identify fractures and foreign bodies.3,4 As early as 1897, the noted neurosurgeon Harvey Cushing, in his first publication, reported on a patient with Brown-Sequard syndrome after a gunshot wound, in which spine x-rays showed the bullet lodged in the C6 vertebra.5 It took at least 10–15 minutes, if not longer, to obtain an exposure of the spine, and there was no way to angle the x-ray tube or eliminate scattered radiation.6⇓–8 The reason for the dearth of literature on spine imaging before approximately 1920 is not entirely clear. Bull7 suggests that clinical localization of spinal lesions presented less of a dilemma than intracranial lesions; thus, there was little impetus to develop imaging of the spine beyond x-rays. Others suggest, however, that little useful information was obtained from early spine x-rays beyond identifying fractures and foreign bodies.2 Tomography was introduced as early as 1914.9 This allowed the detection of subtler abnormalities such as complex fractures, bone fragments within the spinal canal, and cortical erosions; however, it was still only osseous changes that were detectable.8,10 Despite these limitations, spine x-rays have remained a mainstay of imaging for a variety of traumatic and nontraumatic conditions of the osseous spine, unlike skull x-rays, which are now virtually obsolete. Myelogram in a 30-year-old man with radicular pain. A, Lateral lumbar myelographic image shows a typical extradural defect indenting the ventral dural sac at L4-L5 (arrow). B, Frontal lumbar myelographic image shows the defect, which is also resulting in poor filling of the right L5 nerve root sleeve (black arrow). Note that the needle remains in place (white arrow), presumably for removing the contrast. The 1960s saw the introduction of new ionic water-soluble contrast agents. Meglumine iothalamate (Conray, Mallinckrodt, St. Louis, Missouri) and meglumine iocarmate (Dimer X, Laboratories AndreGuerbet, Paris, France) could both be used for myelography without spinal or general anesthesia, unlike the earlier used methiodol.36,37 Compared with iophendylate (Pantopaque), these agents provided better filling of the nerve root sheaths.37 While still neurotoxic, they were less so than other ionic water-soluble agents introduced around the same time. Acute side effects associated with their use included muscle spasm, paresthesias, and seizures.37 As with the older contrast agents, adhesive arachnoiditis was a long-term complication.38 Their use was mainly limited to lumbar myelography, they never gained wide acceptance, and the use of Pantopaque and Abrodil continued in the United States and Europe, respectively, into the 1970s. Inadvertent use of other ionic water-soluble contrast agents has resulted in severe complications, including severe muscle spasms, seizures, cerebral edema and hemorrhage, coma, paralysis, hypotension, hyperthermia, rhabdomyolysis, multisystem organ failure, and death.39 Sporadic reports of such inadvertent use have continued into the 21st century. Radiologists must remain vigilant when performing myelography to ensure that only the appropriate contrast agents are used. Frontal image from a cervical myelogram showing a typical intradural extramedullary mass. The mass is widening the adjacent subarachnoid space with a meniscus of contrast surrounding the mass (black arrows). The cervical cord is compressed and displaced away from the mass (white arrows). 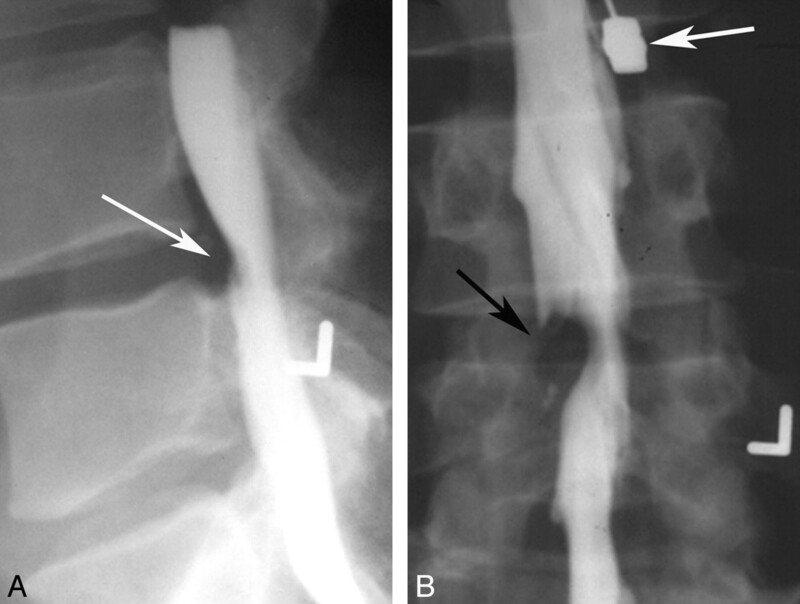 Cervical syrinx cavity demonstrated by myelography and myelocystography. A, Frontal cervical myelographic image shows a typical intramedullary mass with enlargement of the cord and thinning of the surrounding subarachnoid space (arrows). B, Lateral image of the cervical spine obtained during cyst puncture at the C4 level shows a needle tip projecting over the middle of spinal canal (white arrow) with a small amount of contrast in the cyst (black arrows). C4 was chosen as a site of puncture because this was where the cord was most expanded. C, Frontal image of the lower cervical and upper thoracic spine obtained following needle removal, showing contrast with a cystic cavity, compatible with a syrinx (arrows) extending inferiorly to approximately T7. 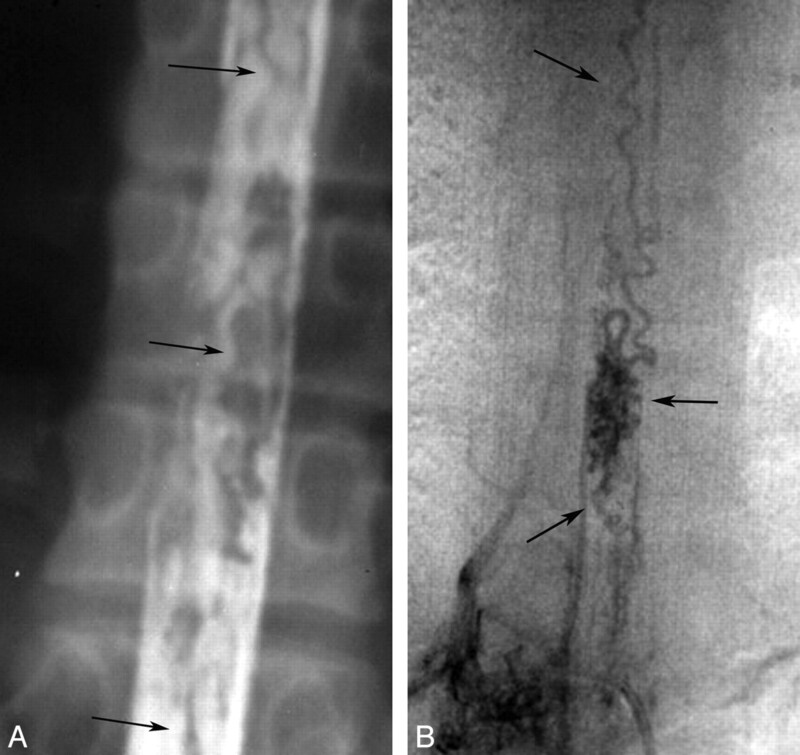 It was not uncommon for the syrinx to be more extensive than suggested by myelography. Spinal cord AVM diagnosed with myelography and angiography. 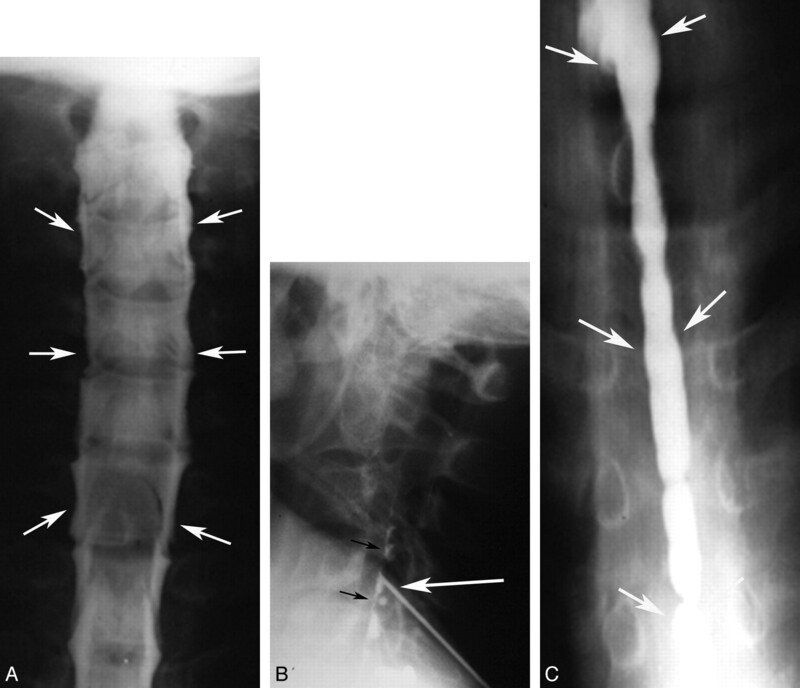 A, Frontal myelographic image of thoracic spine shows multiple serpiginous filling defects (arrows) compatible with enlarged vessels from a vascular malformation or vascular neoplasm. B, Frontal image of the thoracic spine from a spinal angiogram shows an abnormal tangle of vessels (arrows) compatible with an AVM. The first CT scanner introduced in 1973 was only capable of imaging the head.53,54 The following year, Robert Ledley, a dentist by training with an MA in physics, who was a professor of physiology, biophysics, and radiology at Georgetown University, developed the first whole-body CT scanner.55 Ledley, who founded the National Biomedical Research Foundation in 1960, had recently lost his National Institutes of Health funding and was looking for a project to maintain his lab. He was shown a brochure of the original Electric and Musical Industries CT scanner (ACTA Scanner, Pfizer, New York, New York) by a neurosurgeon at Georgetown University.56 Frustrated by the limitations of this scanner and aware of Allan Cormack's work, he determined that he could build a CT scanner by using the convolution image-reconstruction technique that could image the whole body.17,56 The prototype scanner was built with the help of a local machine shop and Cadillac car dealership.56 The first articles on this technique appeared in late 1974 and early 1975, including an article on its use in the diagnosis of syringomyelia by Ledley and neuroradiologist Giovanni Di Chiro.57 The axial images of the spine were 7.5 mm thick with a 2-mm gap. Metrizamide CT myelogram. A, Axial image at L5 shows a low-lying tethered cord (arrow). 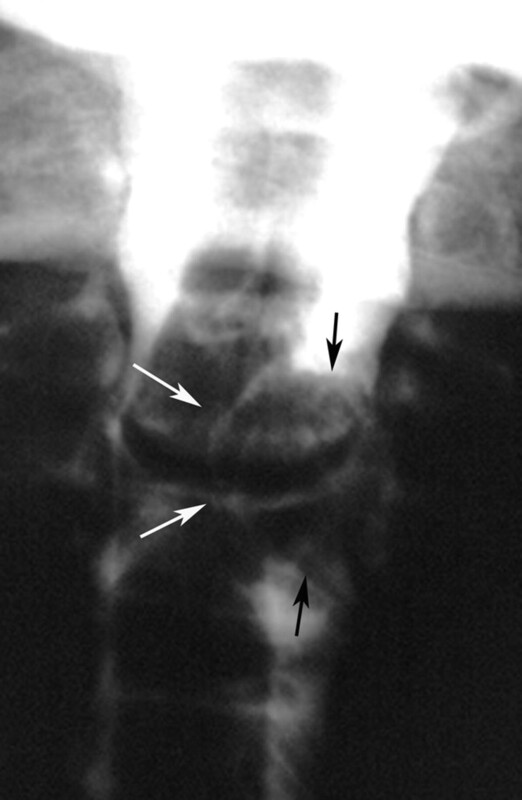 B, Axial image at the level of the sacrum shows an intraspinal lipoma (arrow). Although the history of MR imaging dates back to the 1940s, the first commercial MR imaging scanner was introduced in 1980 and the first superconducting magnet was put in clinical use in 1981.61 Publications on the clinical use of MR imaging of the spine began appearing in the literature in 1983. These initial studies were performed on 0.15T-0.6T magnets, and spatial resolution and signal-to-noise ratios were poor by today's standards. The minimal section thickness for MR imaging was 1–1.5 cm, and a T2-weighted sequence could take up to 40 minutes to perform. However, the tissue characterization and multiplanar capability allowed delineation of a variety of intramedullary, intradural-extramedullary, and extradural processes without the need for contrast or ionizing radiation.62⇓–64 Technical advances came rapidly, including multisection multiecho techniques, sequence optimization, surface coils, and higher field strength units, which resulted in improved contrast and spatial resolution.65 Gadolinium contrast agents were first suggested in the early 1980s, with FDA approval of gadolinium chelates in 1988, which improved the detection and characterization of many diseases involving the spine.66 For the first time, the spinal cord and cord pathology could be directly visualized rather than the margins of the cord simply being outlined by contrast. Spinal MR imaging research aimed at acquiring images faster with better contrast and spatial resolution. This led to developments such as fast spin-echo and gradient-echo sequences, echo-planar imaging, k-space substitution, parallel imaging, and phased-array coil technology.77,78 Spatial resolution improved, and 3D imaging with MR imaging became possible. As described in the earlier article in this series on the history of neuroradiology, MRA, DWI, DTI, CSF flow studies, MR spectroscopy, fMRI, and perfusion MR imaging were all introduced. More recently 3T scanners have been introduced into routine clinical work.79 Many of these newer techniques have had limited application in the spine due to technical difficulties that limit image quality, including the high magnetic susceptibility of the structures surrounding the spinal canal, the relatively small size of spinal canal structures, the large craniocaudal extent of the spine, CSF and vascular pulsation, respiration, and swallowing.80 DWI has been applied to the spinal cord and may be helpful in detecting acute cord ischemia as well as other cord lesions.81 MRA of the spine has been shown to be helpful in assessing the spinal vasculature and vascular malformations, particularly as a guide for further endovascular assessment and follow-up after treatment.82 Fetal MR imaging is now routinely used to further evaluate abnormalities seen on prenatal sonography and, in conjunction with fetal surgery, has led to improved outcomes in infants with myelomeningoceles (Fig 6).83,84 These developments have made MR imaging the primary technique used to assess spinal disease. Lateral skull x-ray obtained in a 15-day-old boy born with a lumbar myelomeningocele, which ruptured and was infected. The only treatment available for this infant at this time was antibiotics. 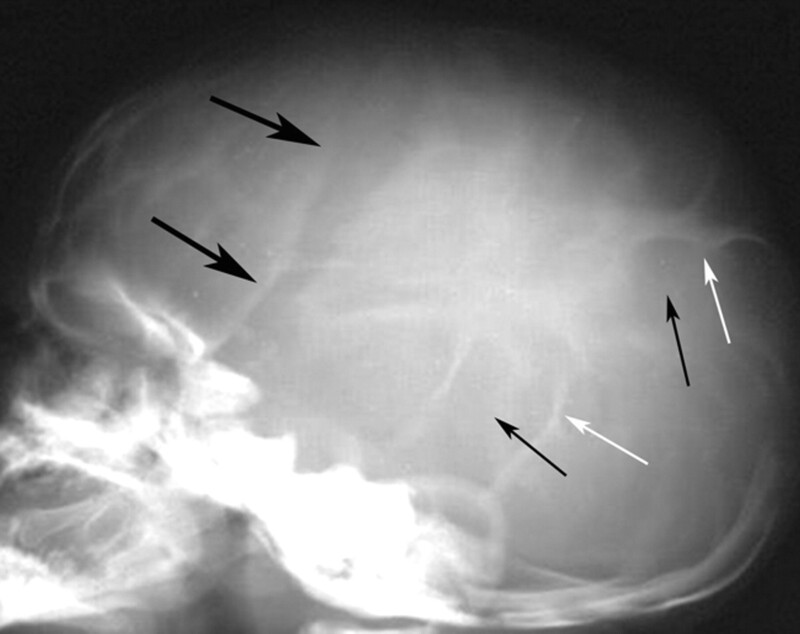 Note typical findings of lacunar skull or Lückenschädel, with areas of lucency (short black arrows) surrounded by areas of normal attenuation (white arrows), giving a soap bubble appearance to the skull. There is widening of the coronal suture (large black arrows), concerning for increased intracranial pressure. To some, imaging of the spine may not be as enticing and imaging advances may not be as dramatic as those of the brain; nevertheless it remains a commonly used (some may even say overused) procedure in all imaging departments. As with imaging of the brain, profound advances have been made in spinal imaging, which have had a positive impact on the diagnosis and treatment of patients. We expect that progress will continue in the future that will lead to even less invasive, safer, and faster more specific diagnostic techniques, resulting in even earlier diagnosis and treatment with a continuing positive impact on patient outcome. Disclosures: Suresh K. Mukherji—UNRELATED: Consultancy: Philips Medical Systems, Comment: Consultant. Douglas J. Quint—UNRELATED: Expert Testimony: Medical legal.
. Magnetic Resonance Imaging of the Spine. 2nd ed. St. Louis: Mosby; 1994:xi.
. Advances in contrast-enhanced MR imaging. Neurologic applications. AJR Am J Roentgenol 1991; 156: 239– 45 .